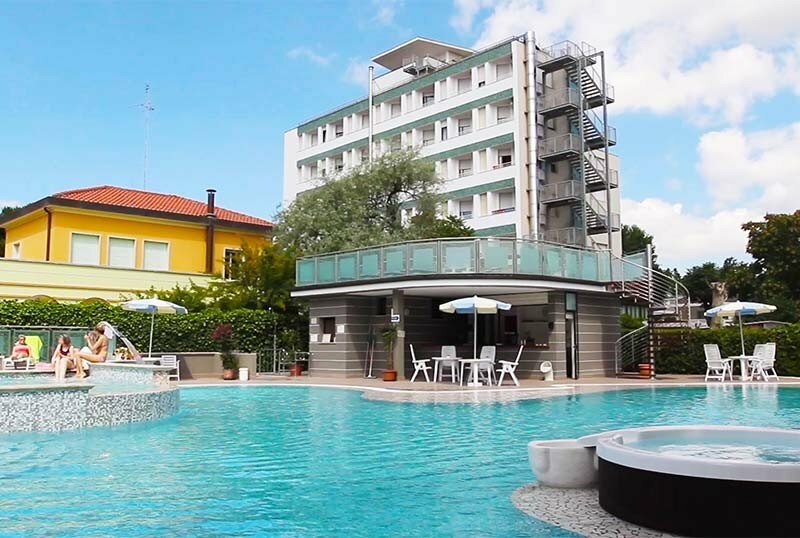 The Club Family Hotel Milano Marittima consists of two hotels "Rio & Ariston" joined together. It is situated directly on the beach, no crossing, in the heart of Milano Marittima a short walk from the pedestrian. For your kids: entertainment with mini and junior clubs, hotels large area equipped with games for children, "Gommoland Park" with its “Pirate ship” and other fantastic inflatable, baby parking during meals, tasty buffet for each child, snack afternoon, small sweets for good night and more. For moms and dads: 2 kitchenettes and biberonerie open 24/24 h., Laundry rooms with washers and dryers, free pediatric consultation on request. We take care of you and your children, we want to realize your dreams! We provide an all inclusive open bar and beach holiday with all comfots for free. Fantastic News 2015: 2 restaurants where you can eat for free to"The Happy Pizza &Co" with pizza, focaccia, fryer and vegetarian dishes or at the restaurant "Mare e Terra" with its grill meat and fish. In both restaurants , you can enjoy delicious appetizers and main dishes, prepared by our chef and fantastic fresh pastries by our pastry chef. New 2015 !!! "Family Boat"
Spectacular views, suspended between sea and sky. “The tourist boat” will depart from Porto Canale Cesenatico and /or Cervia, discovering the beauty of the Adriatic Sea with our Animation team. A free boat ride, available by reservation, for every family that has a minimum stay of 6 days. Great New 2015!!! The bottle “Drinky” to carry out with you all day, beverages are always fresh. Air conditioning, Minibar (empty, for our guests ‘own use), Wi-fi ,safe,bathroom with shower,hair-dryer, services for children on request. 2 restaurants with Front Cooking, where you can dine for free from "The Happy Pizza &Co" with pizza, focaccia, fryer and vegetarian dishes or at the restaurant "Mare e Terra" with its grill meat and fish. In both restaurants , you can enjoy delicious appetizers and main dishes, prepared by our chef and fantastic fresh pastries by our pastry chef. Open bar from 07:30 am to 12:00 pm. at the hotel bar all draught soft drinks (coffee, cappuccino, tea, hot and cold chocolate, etc. ), and draft beer served in glasses. Beach services 1 sun-umbrella and 2 sunbeds (beginning from the 4th row) per room with an open bar . Baby Parking (starting from 4 years old) During lunch and dinner your children can play with the entertainment staff. Afternoon snack for children in the hotel from 3:30 pm to 5:30 pm with an assortment of sweet and savory snacks to please your children. Entertainment provided at the hotel and on the beach. Kids Club (4 / 8 years old) and a Junior Club (8 / 13 years old) at the hotel and on the beach. Air conditioning, balcony, TV, box shower, hair dryer, minibar (also available unstocked), cribs, side rails, tubs, toilet training seats, night lights in the room. Playground for children both outdoor and indoor. Private Parking Hotel (limited availability) Euro 8,00 per day, In addition, the Hotel offers outdoor Parking Spaces. News 2014 "Dine Around": to taste the specialties of our cooking, you can enjoy lunch or dinner during your stay in the restaurants of our Family Hotel in Cesenatico, Milano Marittima, Lido di Savio.